It’s been a little while since we’ve done an update on our Panama Preparation Progress. We’ve been busy! I’ll take a break from packing and organizing for a little bit to fill you in on what’s going on. We are leaving in one week! Wow! We’ve been very busy trying to get things ready and both get rid of and acquire the necessary items for our trip. In the midst of this Daniel had multiple doctor appointments and procedures for a very painful back problem (which seems to be resolved now – yay!) and Allison took time out to visit friends and family in Oregon, which proved to be a very therapeutic weekend and a welcome break from the mounting stress of leaving the country. The house is starting to look very chaotic. After the last (very successful) garage sale we starting packing in earnest and last week with the help of World’s Best Handyman James we moved our first load of boxes to the storage unit. This was helpful both to see how much space we would be taking up and also to free up some space in the house for more packing. We are pleased to report that James is skilled in Tetris, which makes him very well qualified to pack that storage unit like a boss. The girls have ramped up their time with friends. Haley had not one but THREE friends over in the span of 2 days. She recovered with two days of no company. She is Haley, after all. Zoe is focusing her time on her besties and we are hoping to get in a photo shoot with them before we depart. The girls have also been training Phinny to go into his travelling crate and get used to it. We still have a few months before Phinny will join us but it is good to see him tolerating it, if only for a little while and if only with the incentive of a treat. Baby steps. The planning for our Panama arrival has gone as far as it will go until we get there. We’ll stay for 3 days in Panama City to acclimate ourselves a bit and see the sights. Then we’ll move (we don’t know how yet) to Boquete to attend language school for 3 weeks. After that we’ll begin our exploration of the country for a permanent place to live. We have met (online) two expat families with similar aged children and they both live in the same town (Pedasi), so that’ll be a place to check out with great interest. We are looking forward to meeting these guys in person when we arrive, along with the other expats we have befriended online. Panama has no shortage of expats but expats with young-ish kids are the exception, especially those that do not reside in Panama City. The next week will be a whirlwind of packing, selling and saying ‘goodbye for now’ to our Arizona friends. We (read: Allison) are trying to keep the balance of preparation without too much anxiety or overthinking, along with the right amount of social time to focus on what’s important. The suitcases will get packed somehow, someway, but the friends won’t be there on the other side of the international flight so now is the time to connect. We will update again as we can, but you can expect these postings to become much more frequent in about a week! Enjoy the ride along with us. 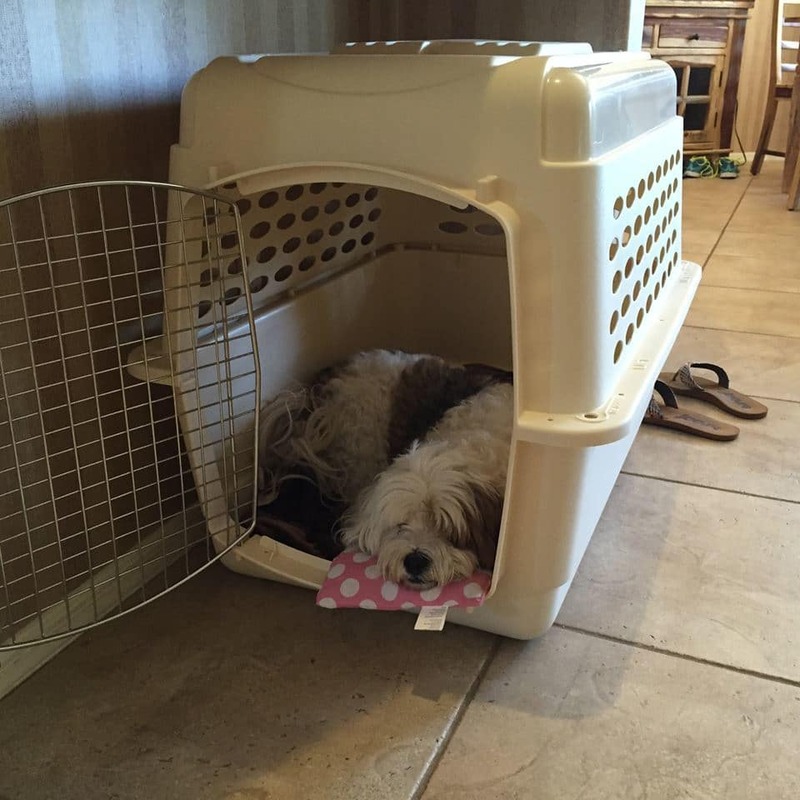 Here is a picture of our storage unit after the first load, and Phinny “enjoying” his travelling crate. 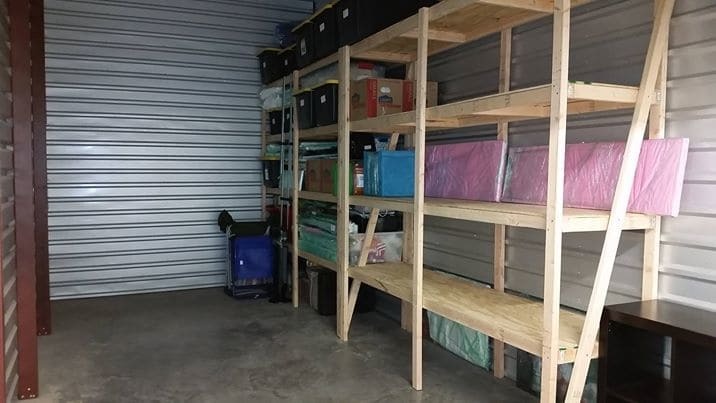 The storage unit, with the awesome shelves. Phinny is getting used to his crate.